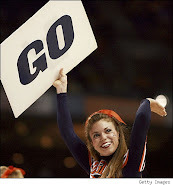 Coastal Carolina, a Div. 1-AA (FCS) school that announced Tuesday the hiring Joe Moglia as its new head coach. Football-wise, Moglia is probably best known as either the executive adviser to the Nebraska football program in 2009-10 or as the former head coach/current president of the United Football League’s Omaha Nighthawks. 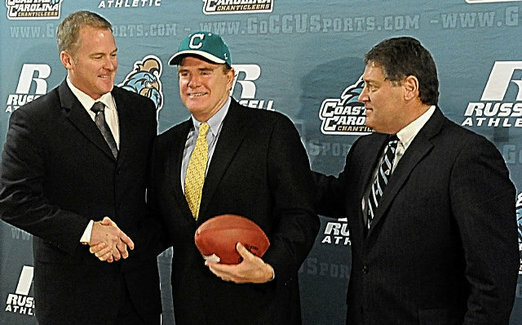 Financial-wise, the 61-year-old Moglia is known as a billionaire businessman who was the CEO of TD Ameritrade from 2001 until becoming the chairman of the board of the same company in 2008, a title he will still hold even as he continues on as the president of a professional football league team and head coach of a college football team. This job at Coastal Carolina will actually be a continuation of Moglia’s coaching career; Moglia coached at programs such as Lafayette and Dartmouth before embarking on a second career in the financial sector in 1983. 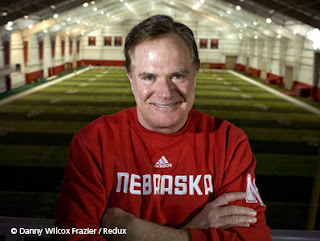 What will turn out to be nearly three decades later, however, Moglia will be back at the collegiate level in 2012. Going back to his time with the Cornhuskers, Moglia was effusive in his praise for athletic director Tom Osborne and head coach Bo Pelini. In fact, Moglia said if it weren’t for the time he spent in Lincoln, he wouldn’t be where he’s at in his life right now, which is apparently a very rich man with a really, really cool third job.